Earl Robinson competing at Shepherd Ranch H.T. Photo by Aaron Sonego. 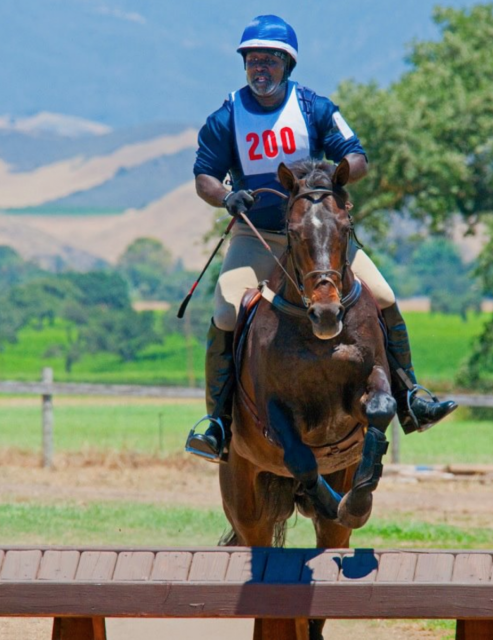 For Los Angeles resident Malcolm “Earl” Robinson, the sport of eventing is something he got into by accident. It all began 18 years ago, when he suddenly developed an interest in learning how to ride horses because of a film project that he was working on. 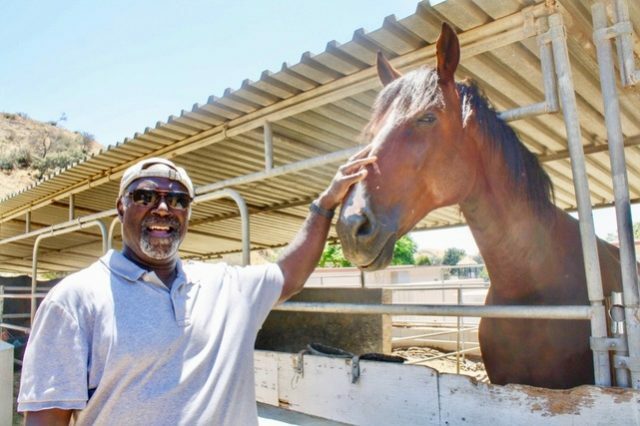 After several years of riding and a better understanding of the sport, he finished his script titled Three Day, about an elite USC football player who returns to Compton after he sustains a career-ending injury and tries out a new sport … eventing. Through his writing, Earl found out that he had more of a connection to the sport than he ever could have imagined. And as we say, the rest is history. Earl, a self-employed personal fitness trainer, was introduced by one of his clients to the sport. 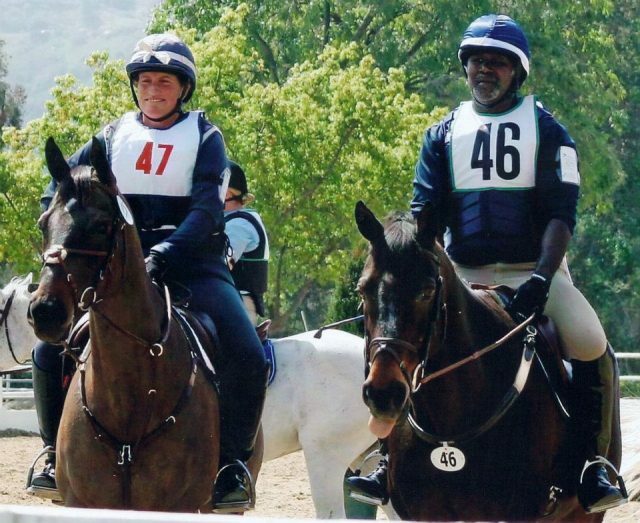 She referred him to West Coast three-star rider Gina Economou, who owns Pepperwood Riding Center in Sun Valley, California, where Earl now trains two to three times per week. Earl at Pepperwood Riding Center. Photo by Shanda Pierce/The Chocolate Voice. While training at Pepperwood, he began to wonder where everyone and their horses were disappearing to on the weekends. That’s how he found out that they were off competing at events. Earl, who grew up in Tucson, Arizona, was always into horses. His siblings and the rest of his family, as far as he knew, were not. But while attending his father’s funeral in St. Louis, he learned something different from his maternal side of the family. His mother, who was born and raised in West Point, Mississippi, came from a family that owned at least one or two horses, something that Earl only learned five years after her passing. His cousin told him, “Dude, it’s no big deal for you to be into horses. Your mom was into horses. Everybody in Mississippi owns a horse.” After hearing that from his cousin, it all made sense. Riding was in his DNA. Gina Economou and Earl Robinson competing at Flintridge. Photo courtesy of Earl Robinson. Even before Earl took up riding himself, horses had crossed his life path on multiple occasions. As a child, he recalls fond memories of wanting to be a cowboy. He spent hours watching television westerns like The Big Valley starring Lou Rawls and Duel at Diablo with Sidney Poitier. “Those were the first times I’d ever seen a Black man in a western that wasn’t playing a slave,” he says. Later, while studying at Central Arizona College, his roommate Charlie Sampson was a Black bull rider from Compton. 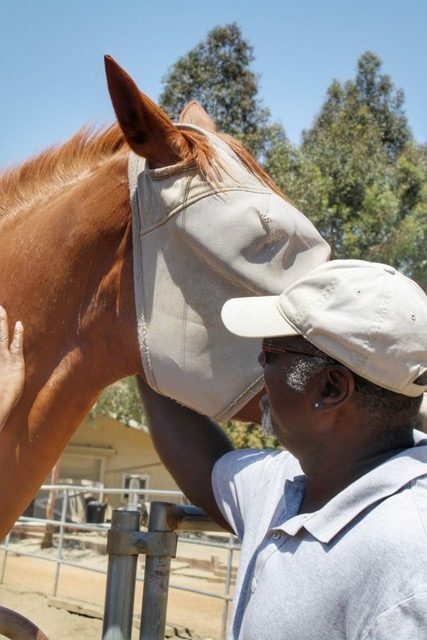 For years, Earl’s trainer Gina has been trying to give Sampson jump lessons, but Charlie says he’s afraid — despite the fact that he rides a 2,000-lb. bull! Photo by Shanda Pierce/The Chocolate Voice. Clearly, horses are Earl’s passion. He walks through the barn, lovingly patting horses and calling out names like, Peanut, Swizzle, Magic and Frank, who all respond to his warm touch. 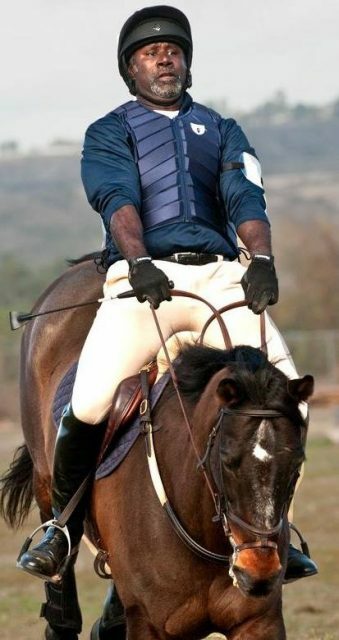 “Yeah, there are some Black people who can ride a horse,” he says.